My wife and I have always romanticized the idea of being bicycle people. When we lived in Brooklyn, we bought two pretty cool-looking but relatively non-functional flea market bikes, which got some use for a period of time before we moved to a new apartment and never bothered to grab them from our previous landlord’s basement. I would say that experience pretty much sums up my relationship with biking: it’s something I really admire, but like a lot of other things I admire, it’s something I haven’t yet been able to weave into my daily life. That being said, a few weeks ago, I decided we needed to make another attempt to change that. It was my wife’s birthday, and I decided I’d go all-in to make up for a few lack luster gifts in the past. 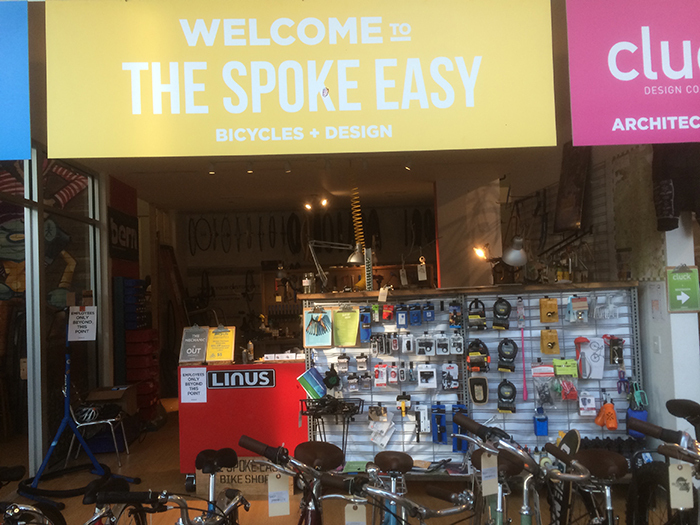 A friend of mine directed me to the Spoke Easy on Elizabeth, and I dropped in to see what’s going on in the world of new bikes. A few minutes in the Spoke Easy, and you’ll come to the realization that it’s more than your typical Schwinn dealership. First of all, there’s a bar there… like, a real bar… where people sit and order beers from a bartender serving all the local favorites. So that’s a step in the right direction for me. Beer and bikes. $2 jalapeño beer from @birdsongbrewing, yes please. If you dig a little deeper, you’ll find that the owners also operate an award-winning architecture firm out of the back of the shop. 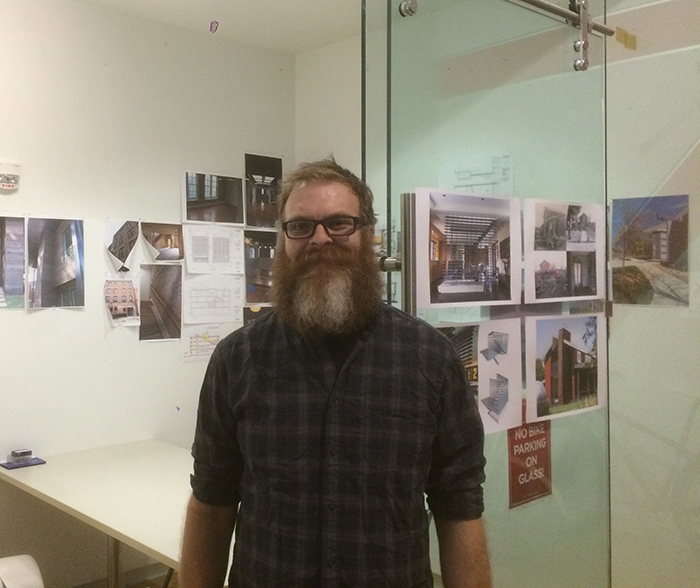 Kevin Kennedy and Chris Scorsone started Cluck Design Collaborative 10 years ago, and since then, they’ve covered a broad range of architecture and design projects working on everything from office furniture to single-family houses to residential towers in India. 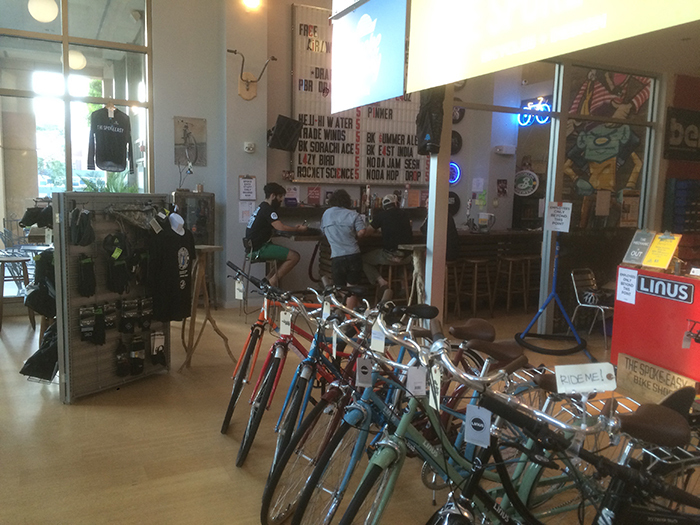 Oh, and they also started a bicycle shop with a bar in front of their office. 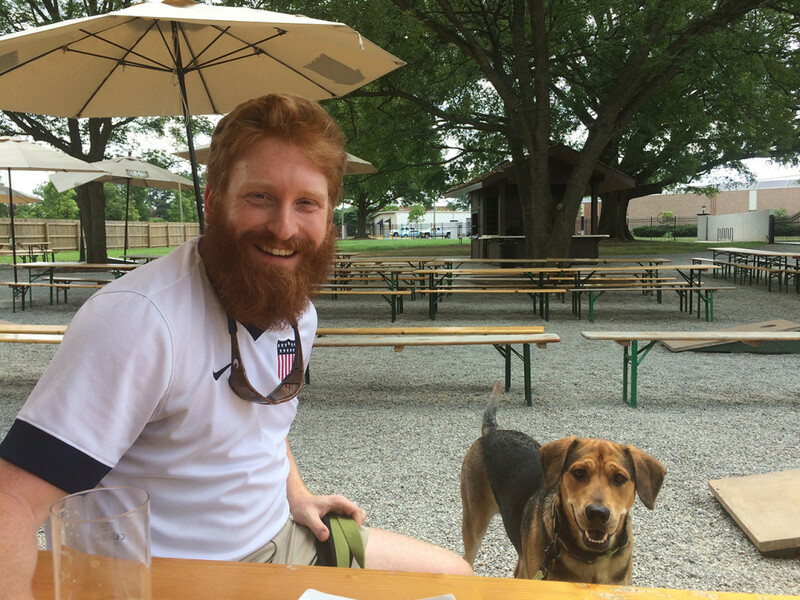 I chatted with Kevin Kennedy for a while and came away wondering why my job doesn’t have a bar at the office and why I don’t work on such awesome stuff. I am. I was born at Presbyterian Hospital, which I can see right now from the shop. I actually grew up in Mint Hill, which is the edge of Charlotte, just on the other side of the Eastland Mall. I had my first haircut on Central Avenue. Except for a brief amount of time back and forth splitting time between here and New York, I’ve lived here all my life. 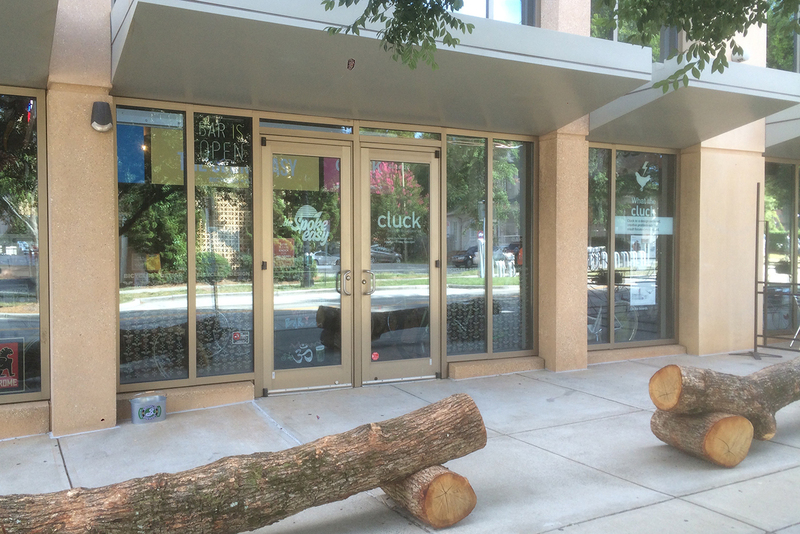 Ok, so you guys have an architecture firm named Cluck Design Collaborative and a bicycle shop named the Spoke Easy where you also operate a bar and conduct yoga classes on occasion? Am I missing anything? Yeah, that’s right. Cluck is the really the original company. 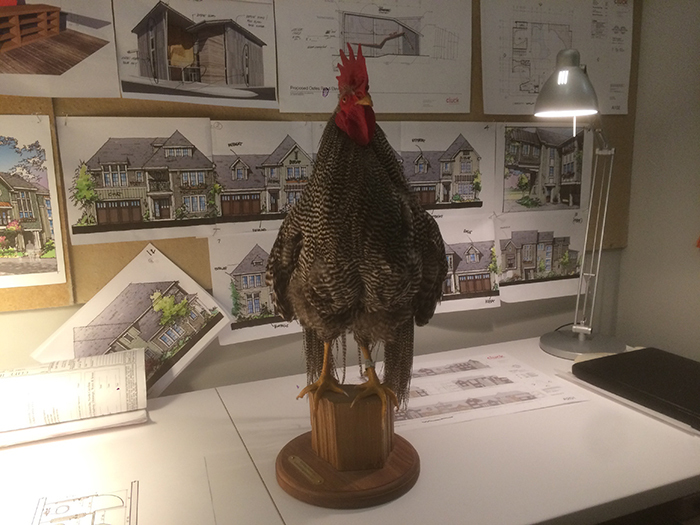 With Cluck, we do all kinds of design. We’ve always stayed away from specializing, and we try to use our creative problem solving skills to tackle a wide variety of different projects. We had a fabrication company that started out with a sustainable cabinet line and making light fixtures, and, we still do that, but it’s kind of morphed into the Spoke Easy. It really grew out of, again, the creative problem solving that is a part of working on a bike or working with steel, which is what we were doing a lot with the fabrication of light fixtures and stuff like that. 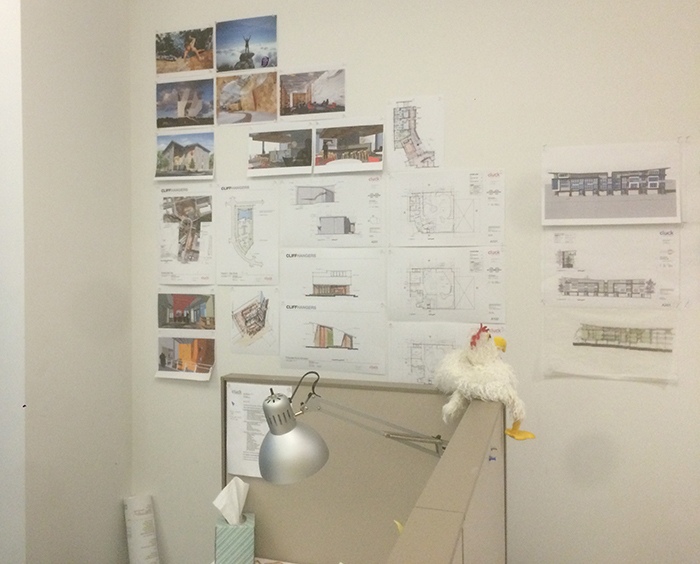 I have a business partner, Chris Scorsone, and we started Cluck 10 years ago. The bike shop is about three years old. For us, the traditional architecture model never really made sense, and we always kind of wanted to have a store front. For us, interacting with people on the street is really interesting and exciting. It’s really an awesome way to find clients for the architecture firm through the bike shop because people come in looking for bikes and they tend to make great clients for the architecture firm. We really like that weird interaction between two different things. What types of projects are you hoping to walk in the door? We consider, in architecture, every time you do a project, you remake the city, so we look for project that will make the city better and projects that will make it a safer city, a more exciting and dynamic city. Right now we’re doing a lot of restaurants and breweries; single-family houses; some small types of infill residential projects. We just finished a law firm in Gastonia, and on that project, we were able to save a four story historic building, you know the old tin ceilings and stuff, for a law firm that is helping to revitalize that downtown area. We’re doing a wedding chapel and catering campus in Waxhaw. We have a couple residential towers under construction in India. We also do a lot of stuff with repurposing shipping containers, so we’ve done projects for Google and Budweiser and lots of big names through that. We’re doing a medical clinic in Haiti that will be fabricated out of shipping containers, and that’s the kind of thing we get really excited about. That’s been really exciting. A lot of the work will be done here and then shipped down in shipping containers and assembled on site. That’s the kind of stuff we’re passionate about. We’re also doing a lot of bicycle infrastructure projects. We did the bike racks in Plaza Midwood, and we’re working with a couple of other neighborhoods in town to do some other projects like that. I’m curious about how you source these types of projects? To go from doing residential towers in New Delhi to bike racks in Plaza Midwood seems like a broad brush. I’m not sure exactly how…we’ve always been word of mouth. We’ve never done any advertising or anything like that as Cluck. Our mission statement is to ‘do good work’, and our careers, having worked with different people, people tend to move around and come back. 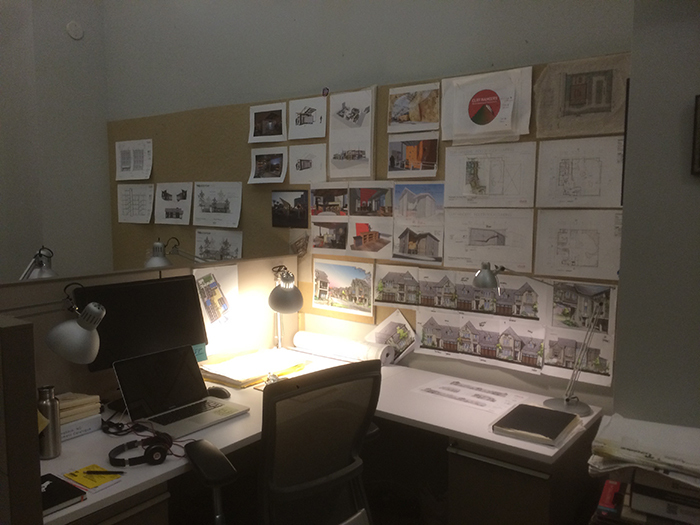 Believe it or not, we do a lot of work for other architects. We won an AIA (American Institute of Architects) award for the Red Barn project that we did in California, which you may have seen on the website. The owner of that project is an architect in LA. His firm does a lot of branding and environmental graphics, and he doesn’t really do architecture now, so he hired us, which was a great honor that he hired us to do his house for him. People in the design field tend to be attracted to our work. You know, we named our firm after a chicken, so a sense of humor is something that we value, and I think that things like that have helped people find us. We kind of put out there what we believe and people have responded to it. We don’t really have a formula for our work other than to do the best job we can for our clients and allow them to tell their friends. Ok, so how did Cluck get into the custom bicycle business? We see bikes as machines, as really useful tools for transportation or whatever, but what was appealing to us… kind of you know, in terms of being the kind of change you want to see in the world, we want to see more people riding bikes and driving less, using less oil basically, which is one of the main reasons that I ride all the time. But the real reason is that it’s more enjoyable. You travel to New York or places like that, you see more stuff and it’s really exciting, and I kind of realized that that had to do with the fact that I was walking or riding a bike and going slow and not zipping around in a car. So we feel like it’s a beautiful and amazing machine. Most of us ride. I commute everyday by bike and rarely drive. Chris was a former sponsored mountain bike rider, so we both have this love of bicycles and this belief that it’s a better way to experience the city. Originally we wanted to design bicycles, but what we quickly realized was that it was a great opportunity for community. I don’t know how much you see of that in the shop; you know, we have a lot of cool looking things, but that’s really what it’s about. Now we’ve realized that creating a place for cyclists is really productive, and it’s been really interesting to see design friends and cycling friends mix. So I think that’s really the focus of the shop, which sort of ties in to the bar we put in shop. We try to support our friends at the local breweries. There’s a lot of pride these days in around beer and Charlotte. So are you guys actually fabricating bike frames back there? Not exactly. We can do that, but more of what we call a custom bike is where we start with a frame and build up from there. So we’ve had people come in and say they want a bike that they can ride to Lake Norman State Park and camp and ride back. So that type of bike has different geometries and components and racks and things versus someone… like we had someone who works at the courthouse and she’s an everyday commuter and she has a ton of files that she has to carry. So we built a bike for her that was designed around that purpose. We had someone who works for the city, and she went to Clemson, so we had the bike and all the components powder coated orange for her. We’re also doing some things where we’re designing bikes for some companies with their logo and custom paint to do branded bicycles for them. 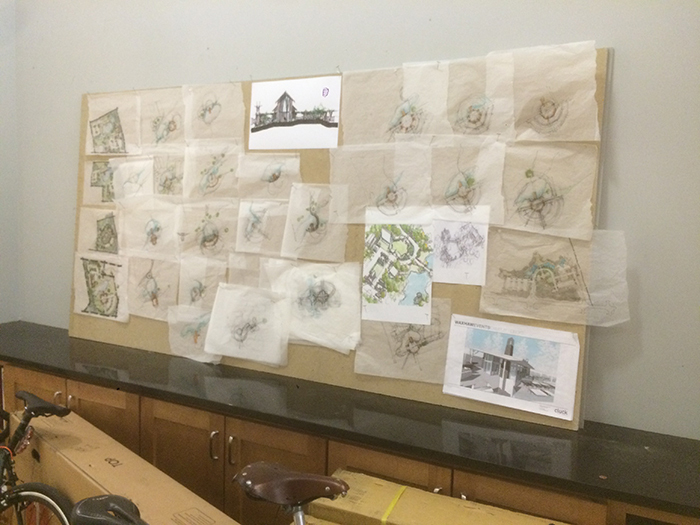 These are some things we do all the time in the architecture world, and it’s pretty fun for us to be able to use some of those cross-overs in the bike shop. How do you see the biking community here? What type of bikers do you get in there? It’s a combination. That’s what’s really great about the Charlotte biking scene. There is a lot of diversity. There are a lot of people who ride mountain bikes. There are a lot of people who ride fixed gear. There are a lot of commuters. There are a lot of people that just use it as a way to go out at night or whatever, but it’s kind of difficult to categorize. Last question, what’s your favorite sandwich from Earl’s? I hit Earl’s pretty often. I usually don’t do the sandwiches; I usually do the salmon and Szechuan noodles. That’s my thing there. The growth of soccer in Charlotte. A conversation with Matt Garner, leader of the Queen City Outlaws.